COL Andrew O. 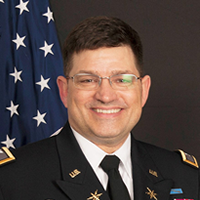 Hall is the Director of the Army Cyber Institute. He studied Computer Science at West Point, Applied Mathematics at the Naval Postgraduate School, and Operations Research at the Robert H. Smith School of Business at the University of Maryland. He has served on the Army Staff, Joint Staff, and MNC-I/XVIIIth ABC Staff deployed to Iraq. He is a Cyber officer and was instrumental in creating the Army’s newest branch.